Read more about the Women’s Vegetable Growing Project. We ran out of funding for more women. Any donation welcome! Why do I give to Sherbro Foundation Sierra Leone? I want the girls and women of Sierra Leone to have the same opportunities for education I had. With education, they’ll lead their community and country to prosperity. I had help along the way. They deserve no less than I had. With that help, they’ll do as much as the women in the US have done. I’m sure of that. Students have their first computer lesson. Top on my helping hand list to Sierra Leone is computer literacy and IT skills. With those skills, the girls and women of Sierra Leone will lead their country into a 21st Century economy, build a middle class and a bridge to stability. That’s how Sherbro Foundation started. It was my desire to give girls in the rural community of Bumpeh Chiefdom a first class secondary school education – and cap it off with computer literacy. We’re ready to get back to both of these – as soon as we can get through this Ebola thing. Teachers are anxious to get back to teaching. We’re starting to rebuild our girls scholarship fund after diverting money for community Ebola response. The community computer center has been built with 50 computers waiting for students. It will have its grand opening when the schools reopen. (For now, Ebola dictates no public gatherings.) Next step is raising the balance of funds needed for a solar energy system. With solar, we can run into the evening, doubling the classes and offer adult literacy night school. So, stay tuned for 2015. It looks to be a promising year. Join us to kick-start the new year. Do some good. You’ll feel very good. Help Bumpeh Chiefdom in Sierra Leone emerge from the Ebola crisis and build a better future. Here’s why I give to Sherbro Foundation and what I want to see in their future. Share the reason for the season. Even small gifts make a BIG difference. DOUBLE your money now – 1:1 matching! Help Sierra Leone more. Pass this on to a friend. Through millions of online clicks and offline acts, we expect #GivingTuesday will take many forms, but all will be energized by a common impulse to make life better, especially for those in need. What are you grateful for? Reflect. 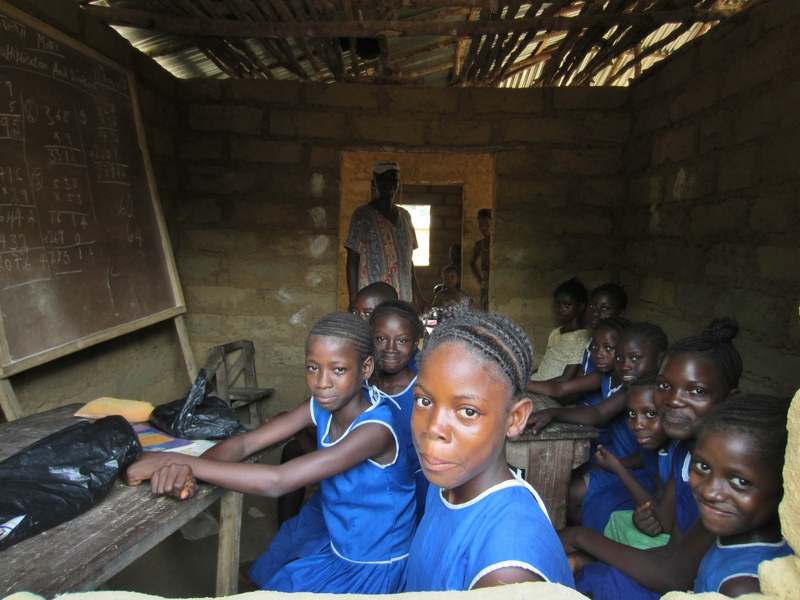 Give to help Sierra Leone emerge from the Ebola Crisis and build a brighter future. Your donation is now DOUBLED with 1:1 matching.